Brian and I attended a lovely potluck picnic in the park this weekend. Sure, we had lots of ideas for yummy things to make, but none of them were quite right for this event. We needed something that wouldn’t melt (chocolate desserts were out), didn’t need utensils to be enjoyed (who knew what the hosts would have on hand), it needed to be super portable (we were going to have to walk to our destination) and we needed to whip it up the morning of the event. I decided to experiment with a cheddar corn muffin that I’ve made dozens of times before. But this time, I added in some fresh basil (thanks to my coworker’s garden) and a bit of tomato paste and reduced the serving size. The end result was quite fun. The mini muffins had a flavor reminiscent of a fancy pizza, but the basil really freshened up the whole experience. The size of these also turned out to be a bonus. The potluck was filled with so many yummy treats that everyone wanted to try. I’m glad they could enjoy just a bite of our dish and then go back for seconds if they had room later. I came home with an empty tray, so I guess they did! 1. Preheat oven to 350°F. Fill a mini muffin pan with paper liners and set aside. 2. In a medium bowl, combine the cornmeal, flour, salt, baking powder and baking soda. Mix until well combined and set aside. 3. In a large bowl, combine the eggs and buttermilk. Slowly whisk in the cooled melted butter. Slowly incorporate the dry ingredients into the wet ingredients in two batches, mixing well between each. Stir in the tomato paste until well combined and then fold in the cheddar cheese and basil. Fill prepared muffin pan with batter (each cup should be 3/4 of the way full) and cook for 11 to 13 minutes or until a toothpick inserted into the center comes out clean. Remove to a cooling rack. Repeat until remaining batter is used up. SWWU Tip Make sure these have plenty of time to sit before you serve them, about 6 hours. If you dig in too soon (like I did), they won’t have enough time to cool and the paper liners will stick. 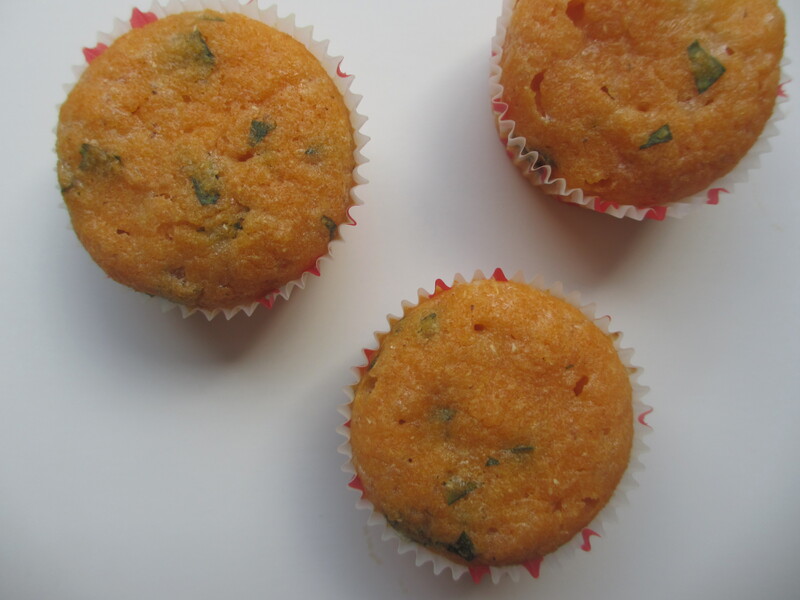 This entry was posted in In the Kitchen and tagged @SWWUblog, appetizer, basil, cheddar, corn muffin, in the kitchen, party food, picnic, recipe, summer, tomato by Something We Whipped Up. Bookmark the permalink.